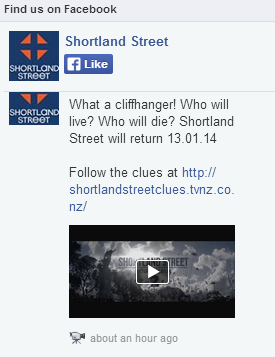 Well after the show there was a TVNZ advertisement where fans can go to a website to find out clues as to who died. So I went to have a look... and the website they advertise doesn't exist. Site not found. I'm watching on Tivo so I went back to check the address. Yep, I had it right. But the address they are advertising hasn't even been registered. Any ideas what I should do with it? You def need to think up something better than a rick roll. Perfect just as it is. Genius. Are you sure that's the site they advertised? KevinL: Are you sure that's the site they advertised? Ooopos. check your recording - you might have spent some $$$ on the wrong domain? EDIT: I see the screenshot! Do you have Google Analytics or something to measure the number of visitors and where they are coming from? Make people answer lots of pointless questions for a rickroll. Have a pointless countdown timer. Have a signup form that always fails. Really either way you look at it, by the time you manage to think up and create a good enough troll, TVNZ would have realised their blunder and advertised a new url. Or they could not and you could have the time of your life trolling TVNZ. freitasm: Do you have Google Analytics or something to measure the number of visitors and where they are coming from? Nah... I'm not too clued up on that. I'm sure TVNZ will pull/edit the advert as soon as they realise their mistake. Don't let it go for cheap, you may have a golden ticket there. But a good laugh no less. Well done.